An evil has entered into this world, unleashed on all of life as we know it... unlike any other evil brought to fruition in the history of the human species. 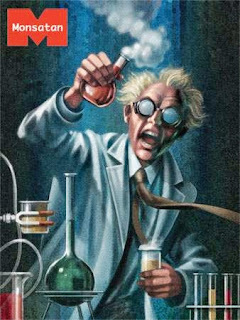 An evil with a new face brought into this realm by corporate greed (love of money) via scientific advancement. Our relatively new understanding of the building blocks of life have led to some amazing breakthroughs in understanding in the bio-sciences but this technology has fallen into the wrong hands. The largest of the hands belong to the Goliath of the industry known as the Monsanto Company, headquartered in St. Louis, Missouri. I say the wrong hands as the company has shown it's true colors in it's amazingly aggressive legal tactics that enslave farmers and consumers and that they have not given the proper time such a new technology deserves in research to the impact their products will have long-term on consumers and the environment. They do make some amazing products. They're making a tremendous amount of money. Many feel some scary and terrible things are happening around the world due to these products. Which can only be seen as a tip of an iceberg in that it is all so new. What are these new products that's causing so much anxiety around the world?... and yet unreported on by the Main Stream Media? It is genetically modified food crops. Or as they are commonly known as Genetically Modified Organisms (GMOs.) Or GE for Genetically Engineered. embedded in this post. It will bring you up to speed much quicker! What is GMO? 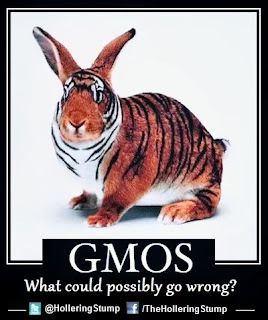 According to the NonGMOProject web site, "GMOs, or 'genetically modified organisms,' are plants or animals created through the gene splicing techniques of biotechnology (also called genetic engineering, or GE). This experimental technology merges DNA from different species, creating unstable combinations of plant, animal, bacterial and viral genes that cannot occur in nature or in traditional crossbreeding." What food crops are being genetically modified? There are more than 40 genetically modified crops being grown and offered to consumers in the U.S. The most common... corn, soybeans, canola and cotton are produced with 2 traits: herbicide tolerant (HT) and insect resistant (Bt) and are offered by Monsanto, Dupont, Dow and Syngenta. Virus resistant papaya and squash is being grown on a small scale. Other products allowed for consumption but are probably not being sold in the U.S. are HT sugar beets, male-sterile chicory, Bt potatoes, 4 Bt corn products and the FlvrSavr tomato. This tomato, developed by Calgene (Davis, CA, later acquired by Monsanto in 1996) in 1991 after 10 years of development was the first GM vegetable or fruit sold in the world. Over concerns of findings that showed possible negative health effects by the U.S. Government's own scientific advisers it was approved at the federal level where it was decided that GM foods in general would not require pre-market approval. But due to heavy legal pressures from Monsanto and the fact the GM tomatoes we more bland than non-GM tomatoes they were only sold in a small number of outlets in the Mid-West and California for a short period of time before the product rapidly disappeared from the market. Followers of TheHolleringStump.com on Facebook have received whatever updates I would come across concerning the honey bee die-off on this continent for the last few years. Mainly because... I'm concerned! Honey bees are credited for pollinating over $15 billion of the U.S. crop production. If we lose the bees, we lose the plants. We lose the plants, the whole circle of life is screwed. According to the American Beekeeping Federation's (ABF) site, On May 2, 2013 the USDA and the EPA released a "comprehensive scientific" report on the health of the honey bees. 2 of the 4 factors they attributed to what is known as "Colony Collapse Disorder" are poor nutrition and exposure to pesticides. Which may very well be attributed to GMO corn. From Phys.org comes an article entitled, "Research Finds High-Fructose Corn Syrup May Be Tied To Worldwide Collapse Of Bee Colonies." Here is a bit of it... "Commercial honeybee enterprises began feeding bees high-fructose corn syrup back in the 70's after research was conducted that indicated that doing so was safe. Since that time, new pesticides have been developed and put into use and over time it appears the bees' immunity response to such compounds may have been comprised. The researchers aren't suggesting that high-fructose corn syrup is itself toxic to bees, instead, they say their findings indicate that by eating the replacement food instead of honey, the bees are not being exposed to other chemicals that help the bees fight off toxins, such as those found in pesticides." - Click here for full article - What if what Adams says in the video is true? That... unless otherwise labeled all corn available is GE? A lot of by-products are based on corn. 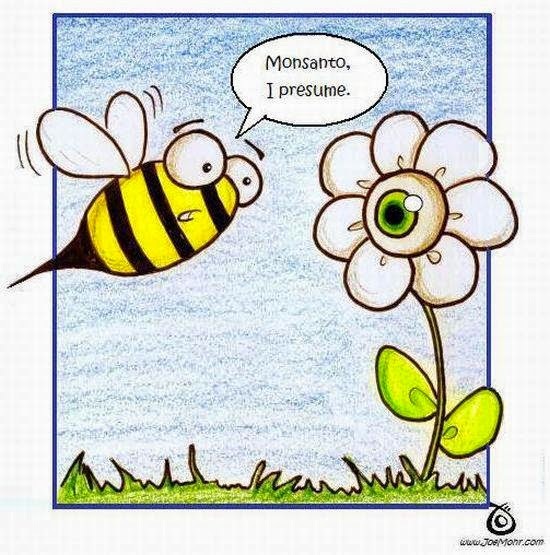 GMO corn is producing Monsantos' #1 pesticide Roundup within itself. What if the GMO corn based high-fructose corn syrup is passing on the DNA code for Roundup to the honey bee? Could science distinguish if the poison was ingested?... or produced from within?! Or both?!! These poor little critters WE depend on are getting double whammied! From what they're being fed (GMO corn syrup) and they are pollinating genetically tampered corn (and who knows what else!) that's producing RoundUp from within the plant itself! The Colony Collapse began in 2006 according to all the experts. From Monsanto's own web site I found these tidbits on its history timeline page... 2005 - "Monsanto introduces the first triple-trait technology offered by any company in the agriculture industry. YieldGard Plus with Roundup Ready Corn 2. The product offers three traits in one seed - including Monsanto's two YieldGard insect-protection products and its Roundup Ready technology." Another entry in this year is, "Monsanto acquires Seminis, Inc., a global leader in the vegetable and fruit industry. Seminis supplies more than 3,500 seed varieties to commercial fruit and vegetable growers, dealers, distributors and wholesalers in more than 150 countries around the world." 2006 - "Roundup Ready Corn 2 technology is planted on more than 32 million acres - or about 40 percent of U.S. corn acres - during the 2006 crop season." The Colony Collapse initiates in 2006. The same year 40% of corn acres are first planted with GMO seed. I don't think it's a coincidence. And I believe this must be but a fraction of the tip of the iceberg. Sure... I had delusions of grandeur soon after seeing this. Accepting a Nobel Prize, getting on Wheaties boxes... but c'mon! I ain't ever been accused of being that smart! This must've been investigated by someone! I have submitted most of what I see may very well be the cause of the Colony Collapse to a local TV station through FB over a month ago but got no reply. 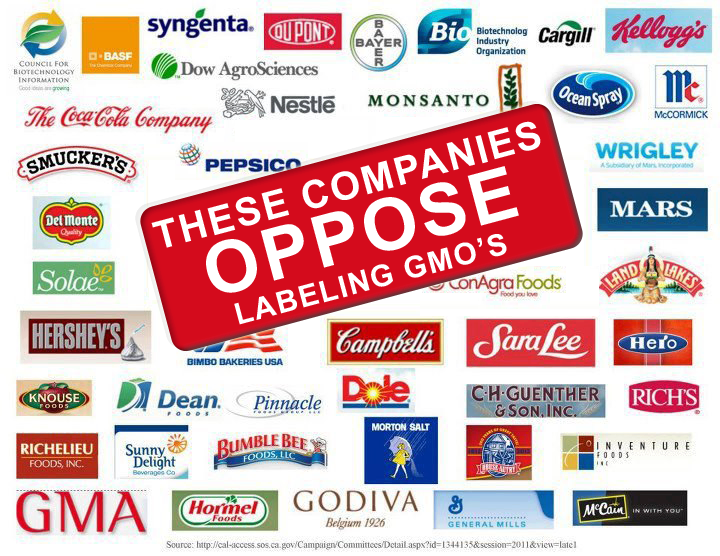 Estimates are showing up to 80% of processed foods are made with GMO products. Infant formula is made with GMO soybean. Don't you feel you have a right to know what it is you and your family are consuming? 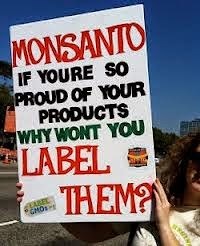 Monsanto's fighting the labeling movement. Obama promised in his 08 run for the White House he would... if elected... "immediately implement labeling". But like so many promises he made, has done the opposite. (Anybody got the figures on Monsanto's political donations?) The world wide protest held on May 25, 2013 didn't get any MSM coverage that I saw. Other countries are banning this stuff. I've seen too much footage and read too many articles from around the world to not think something is wrong with the GMO products being used. Get educated on this if you're not already. There's plenty of links to start with on this page. Take the time to watch the videos below. Get involved! I perceive Monsanto is treating this just as big tobacco defended cigarettes for decades. Genetically engineered seed is not!... to say the least!... ready for use. Labeling is a first step towards awareness. Then on to stopping it altogether before all seed on this planet becomes contaminated!